Here is a question someone asked me about increasing his concentration while studying. I am a student, and I would like to know how can I increase my concentration and focus while studying. When I sit down to study, my mind constantly wanders to other matters and I cannot concentrate. I just waste my time thinking, daydreaming, listening to music or getting up and doing something else. I promise myself that I would focus my attention on what I am studying, but each time I sit down to study I cannot carry out this decision. I believe that a great number of people ask the same question. For this reason, I decided to write here about this topic. Often, when we sit down to study, our mind wanders away, we daydream, think of other matters, or do everything else, except study. We need to learn focus on the task at hand, and for this, we need concentration. 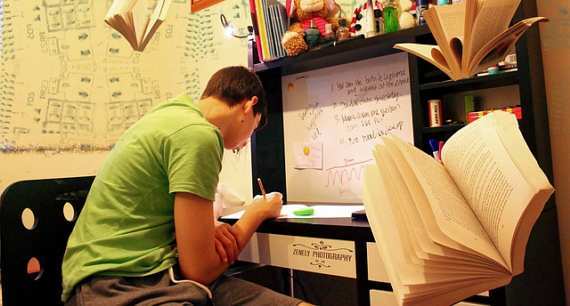 You can certainly increase your concentration and focus while studying. Of course, you will not instantly possess powerful concentration. This is a gradual process. 1. Turn off your TV, radio and cell phone. Yes, I know, that’s really difficult. 2. Drink some water and eat a fruit, a snack, or a light meal, so that hunger will not disturb your focus. Do not eat a heavy meal before sitting down to study, because it will make you feel sleepy. 3. Sit down to study, but do so for only 20-30 minutes. Then, get up and do something else for a few minutes. Afterwards, return to study. This procedure will make you feel more relaxed, because you know that in a little while you can rest and do something else. 4. You also need to practice concentration exercises. Even a few minutes a day of exercising would improve your focus and your ability to concentrate on your studies. 5. If you wish, and find it helpful, you may play some calming and relaxing music in the background. Do not play noisy music, or music that that makes you want to sing or dance, since your goal is to focus on your studies, not on the music. I have written a few articles about concentration, which I invite you to read. I have also included a few simple exercises in one of the articles, which you can find in the article titled, Concentration Exercises for Training the Mind. If you want to get stronger and sharper concentration, and learn to master your mind, I suggest that you read and practice the exercises in my book, How to Focus Your Mind. These exercises will help you develop strong concentration, and would enable to focus better on your studies and on everything else in your life.